Love to play the card game Pedro? So do we! ​Our next Pedro cruises is the Hawaii November 3-18, 2019 Pedro Cruise sailing roundtrip from San Francisco. Book with us by February 28 and take advantage of Princess' AllAboard Offer with extra shipboard credit and FREE Specialty Dining one night. ​Contact Andi Cercos for more details. There will be Pedro tournaments on sea days and fun pick up games on shorter port days and evenings. The actual origin of the game of PEDRO is a bit hazy and generally depends on one’s nationality. Italians, Portuguese and Irish players all claim the game as their own, but most will agree that it is a San Francisco card game. Most people outside of the San Francisco Bay Area have never heard of it or play a similar version but with a different name. PEDRO is a card game generally played with four players divided into two teams or partners. The game is played with a standard deck of 52 cards, with various points values assigned to various cards. The ace, jack, ten and deuce count as one point each and the trump 5 and the 5 of the same color are each worth 5 points, for a total of 14 points. If you have a bit of card sense the game can be learned fairly quickly, but playing and watching is the only way to learn the finer points and strategy of the game. Nine cards are dealt and players bid and the highest bidder declares which suit is trump. Once the trump suit is declared, players discard all cards except trump. Additional cards are dealt , for a total of six cards per player. 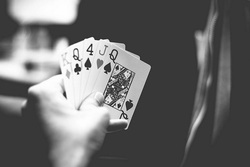 The object of the game is to make your bid and score 61 points before the opposing team or in tournament play the highest score after eight hands.